A New Convection Oven: Success with Biscuits! After much deliberation and angst, Clif and I finally made a decision about our new electric range, which has made us so unhappy with its burning ways. After doing a lot of research, we found that it cost less to buy a free-standing convection oven than to return the Whirlpool electric range we just bought and replace it with an electric range with a convection oven. Therefore, we bought a free-standing convection oven—a Hamilton Beach 31103A. It came yesterday, and we were able to rearrange things in the kitchen so that no counter space was lost. The many comments on this blog were a big help. Thanks to all of you who shared your oven stories. It made us realize two things—new standard electric ovens have a tendency to burn baked goods, and convection ovens do a beautiful job when it comes to baking. This was reinforced the other night when we had dinner at our friend Mary Jane’s house. There were nine of us in all, and Mary Jane, who is a terrific cook, had us recount the story of our oven woes. There were protests from some of the other guests, who successfully used cast iron on glass tops without marring the surface. It does seem as though you have to be careful not to slide the cast iron over the glass top. Instead, it has to be lifted up. Richard noted that he wasn’t that careful of a cook, and neither are we. I can easily envision sliding the cast-iron frying pan over the top. For us, coil top is best. The next day, Richard called and told me that Kenmore has a coil-top electric range with a convection oven, and it is listed for $630. (Clif, in doing stove research, found that Consumer Reports gives Kenmore high ratings.) Dave’s, unfortunately, does not sell Kenmore, but if we had known then what we know now, then we would have gone with the Kenmore. But as I mentioned above, it was more economical for us to buy the free-standing convection oven—there was a very good deal through Amazon—and we now have two ovens. While the Whirlpool does a terrible job with baked goods, it does a fine job with dishes that require less precision, such as chicken, baked potatoes, and casseroles. It also does a great job broiling. Finally, the free-standing convection oven, which takes a 9x 13 pan, is much more energy efficient than the larger range. This morning, we tested our new convection oven. I made a batch of biscuits, and success! The biscuits came out exactly as they should, with nicely browned tops. The bottoms were also brown but not crunchy, the way they were when I baked a batch in the Whirpool. 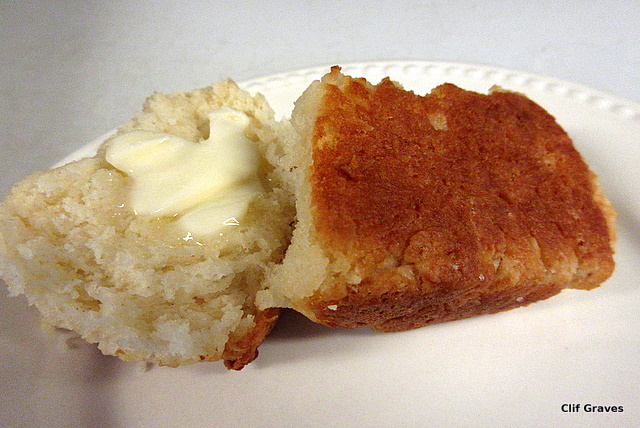 Instead, they were soft, just the way biscuits ought to be. Next I will try making gingersnap cookies, which I could not get right in the Whirlpool, no matter how much I fiddled with the time or the temperature. I’ll be sure to report back. Here is a recap for readers who will be buying a new electric range in the near future. Conventional electric ovens, even the more expensive ones, are not reliable when it comes to baking. Bottoms are burnt and middles aren’t cooked enough. However, many electric ranges—coil top as well as glass top—come with a convection setting, and this is the way to go if you like to bake. Whatever brand you choose, be sure to do some research from a disinterested source such as Consumer Reports. All ranges are not created equal. 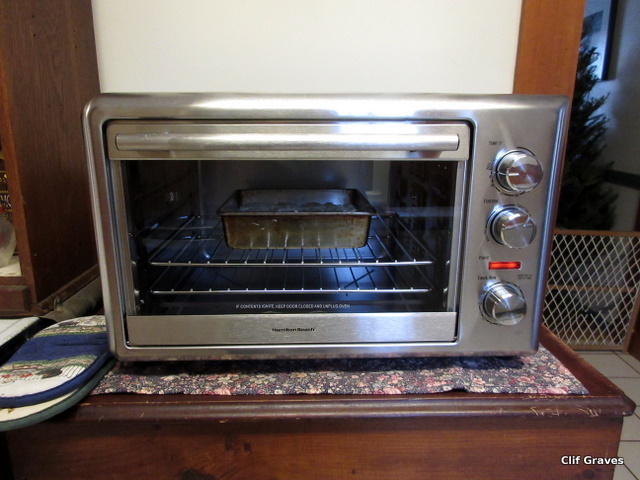 Finally, thanks to Shannon for sending us the review of the Hamilton Beach Convection Oven. We ended up buying a larger model, but that review helped steer us in the right direction. I have been using a kitchen aid countertop convection oven for almost a year. I love it. I hardly ever use my big oven. Carol, it was because of your recommendation that we went with a countertop convection oven. Thanks so much for the info! Our oven does regular or convection – and I use convection most of the time. Also, I always put an oven thermometer in the oven – that gives a better reading of what temp it really is in there – regardless of what shows in the display!! Happy cooking days! Pearl, in retrospect I realize we should have bought a range with a convection oven. Too late, too late! But at least the little free-standing convection seems to work very well. Yay!! Glad the biscuits came out! It’s not ideal having two ovens but even less so to not be able to bake so glad this worked out!! Judy, with the way conventional electric ovens run nowadays, I am convinced that anyone who likes to bake should have a convection oven. Looking forward to making Christmas cookies. Once upon a time ovens were made to last a life time. These are modern times. We are landing on the Moon and Mars and our appliances are adding to the landfill. I’m sure the Martians will turn up their noses if they come to Earth. To me, it is simply crazy that a conventional electric oven will not bake well. What the heck! Yay, success! Bring on the holiday baking! My next foray with the convection oven will be gingersnaps. Eliza, as my Yankee husband noted, pretty darned good.